April 18, 2012 August 13, 2014 Categories Community, Eventscourt & hudson, fashion, flashes of style, iphone, new york city, nyc, on the racks, Posh Party, Profresh Style, shopping, spring 2012, Spring Trends, Style and Pepper, sweet caroline in the cityLeave a Comment on NYC, Here Comes Poshmark! We’re heading to the east coast for the first time and what better way to make our debut than by throwing the ultimate live Posh Party in New York City?! That’s right! We’re teaming up with six amazing NYC-based fashion bloggers and all-around cool gals, who will be opening up their closets on Poshmark for you to shop! The theme of this Posh Party is “Spring Trends,” so be ready for plenty of peplum, polka-dots, neon, pastels, and more! If you’re local, we’d love to have you join us! 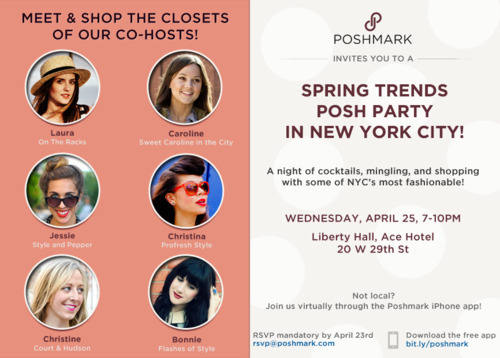 Come mingle, meet, shop and have a cocktail with the Poshmark team and our co-hosts! Simply shoot us a note to rsvp@poshmark.com by April 23rd to get on the guest list (space is limited). If you’re not in NYC, don’t you worry! Join us virtually through the Poshmark app for plenty of Poshmark fun from wherever you may be!